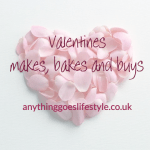 V DAY- Last minute gift ideas for sharing! 2. The perfect couple to share a romantic night in, Jo Malone Pomegranate Noir bath oil (£17-£54) and candle (£22-£280) a gorgeous sensual scent. 3. Bollinger champagne, currently on offer at Waitrose for £33.74 for a 75cl bottle (a saving of 25%!). Pick up some strawberries whilst in store! 5. Most supermarkets are running a meal for 2 promotion where you can get lots of great foods for an amazing price particularly ideal if you didn’t book a table (tut, tut!)! Super easy to cook and takes all the pressure off; there is likely to be minimal washing up too so save it till morning.